Queue jump lanes combine short dedicated transit facilities with either a leading bus interval or active signal priority to allow buses to easily enter traffic flow in a priority position. Applied thoughtfully, queue jump treatments can reduce delay considerably, resulting in run-time savings and increased reliability. Implementation of queue jumps with TSP at 13 locations on a rapid transit route in West Valley City, UT, saw a 13–22% reduction in travel times, and a 22% increase in bus speed. Milan Zlatkovic, et al. Effects of Queue Jumpers and Transit Signal Priority on Bus Rapid Transit. 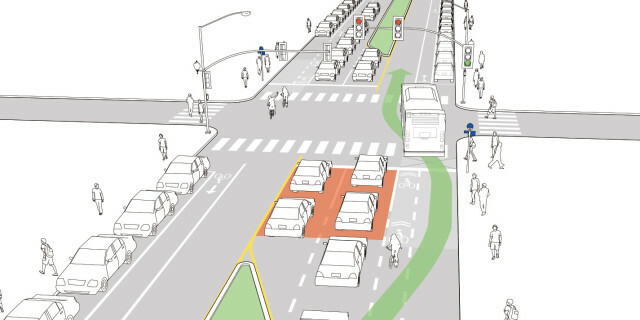 Transportation Research Board Compendium of Papers (2013). On signalized streets with low or moderately frequent bus routes, especially where transit operates in a right lane with high peak hour volumes but relatively low right turns. In some locations, implementing restrictions may be necessary. Fred Kent, III, et al. 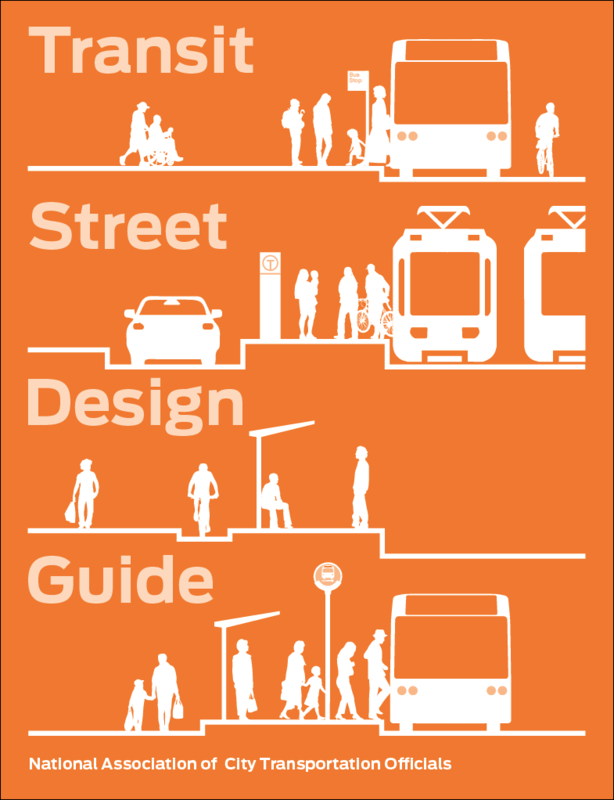 Transit-Friendly Streets: Design and Traffic Management Strategies to Support Livable Communities. TCRP 33, Transportation Research Board (1998). If applied as a longer transit approach lane (see page 164), buses may bypass longer queues. Queue jumps can be applied at near-side, far-side, or non-stop configurations. At near-side pull-out stops, the bus completes loading before rolling forward onto a loop detector that gives priority. At far-side or non-stop locations, the bus receives a priority signal treatment (see page 152), and proceeds either into a far-side stop or ahead of the traffic flow. A bus head start can significantly improve bus performance by routing vehicles through congested intersections ahead of traffic. MicroSim modeling showed a 3-17% reduction in delay combining queue jump lane and near-side stop with active TSP compared to a far-side stop with TSP with no queue jump. Guangwei Zhou and Albert Gan. Design of Transit Signal Priority at Signalized Intersections with Queue Jumper Lanes. Journal of Public Transportation, Vol 12, no. 4 (2009). As congestion increases, bus head starts and bypasses become more effective. VISSIM modeling was used to demonstrate that transit gains the greatest benefit from a full queue bypass lane approaching a far-side stop. As v/c ratio approaches 1.0, queue bypasses (greater than the length of the average traffic queue) with TSP become increasingly effective at reducing transit and general traffic delay. Zachary Bugg, et al. Effect of Transit Preferential Treatments on Vehicle Travel Time. Kittelson & Associates, Inc. ITE Mid-Colonial District Annual Meeting (2015). If vehicle right-turn volumes are high enough for right-turn queues to occur with regularity, right turns should be accommodated separately from transit in a turn pocket. In cities where yield-to-transit laws are enforced, the queue jump may operate effectively without a dedicated transit signal phase. Buses must have access to a lane and the ability to reach the front of the queue at the beginning of the signal cycle. Buses receive a head start with an advance green. Separate signals must be used to indicate when transit proceeds and when general traffic proceeds. Transit signals can be either be a transit specific signal head or a louvered or visibility-limited green indication, making it visible only to the right-most lane. Though effectiveness is dependent on wide-ranging characteristics, far-side stop locations have been shown to improve travel time savings more than near-side locations. MicroSim models have been used to indicate that locating a near-side stop 25 – 100 feet of the intersection increased average net delay up to 10 seconds, while far-side location in this configuration reduced net delay .5 seconds. Burak Cesme, Selman Z. Altun, & Barrett Lane. Queue Jump Lane, Transit Signal Priority, and Stop Location: Evaluation of Transit Preferential Treatments using Microsimulation. Transportation Research Board (2014). Where stops are located far-side, a signal phase progresses right-turning vehicles together with through-traveling buses. The queue jump lane must be long enough so buses can effectively bypass the expected length of congestion at the intersection at peak. As of 2015, use of a transit signal head for bus movements in general traffic requires a design exception, though has been applied in cities such as Austin, TX. “Part 4. Highway Traffic Signals.” Manual on Uniform Traffic Control Devices, 2009 Edition. Federal Highway Administration, Washington, DC: 2009. Where stops are located near-side, right turns are prohibited from happening curbside. The bus pulls into the stop, completes boarding, and then pulls forward onto a loop detector to receive the advance green. 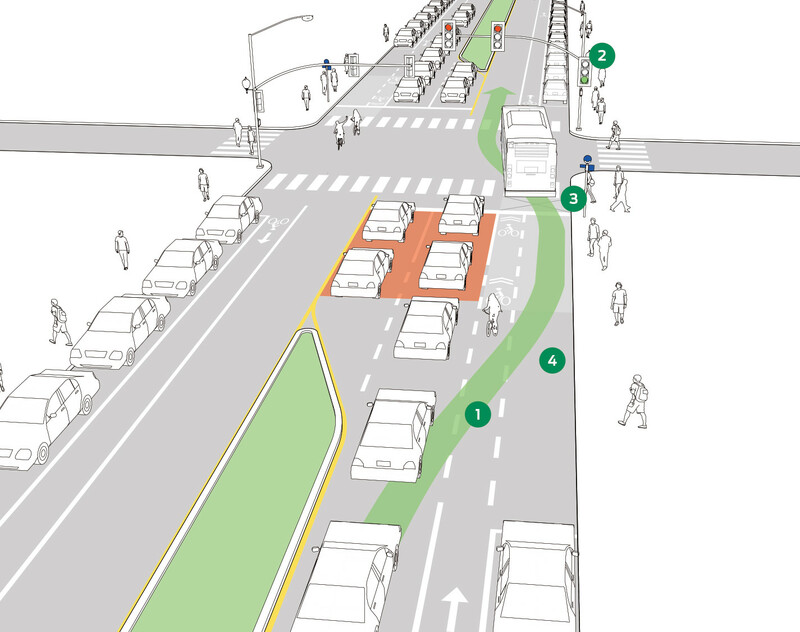 Bus head starts may be made from a shared transit/turn lane or a short exclusive transit lane. The length of a shared head start/right-turn pocket should be long enough to allow storage of right-turning vehicles and allow buses to reach the queue jump during each signal cycle. If provided as a shared right-turn/queue jump, a protected right-turn signal may be used (MUTCD 4D-19), with a sign indicating RIGHT TURN SIGNAL (MUTCD R10-10) and EXCEPT BUSES. References for Queue Jump Lanes: 1 found.